Themes from James Bond films run the gamut from the very good to the downright evil. The stronger ones -- the femme-fatale slyness of "Diamonds Are Forever" or the moody detachment of "You Only Live Twice" -- put the emphasis on attitude. They're dapper musical foils for a cinematic hero who often appears more interested in a nightcap than any sort of spy business. And the bad? Songs such as "Another Way to Die" fromAlicia Keys and Jack White, or Chris Cornell's "You Know My Name," simply plod. They take themselves too seriously, they slap some strings on guitars, and their vocalists try their hardest to sing through manufactured pain. A good number of Bond songs build to a grand finale, but these two examples feel like they unfold in slow-motion. Initial listens to Adele's "Skyfall" reveal a song that's probably somewhere in the middle of the songs referenced in this post, but Adele fans should be pleased. This song has far more to recommend it than not. 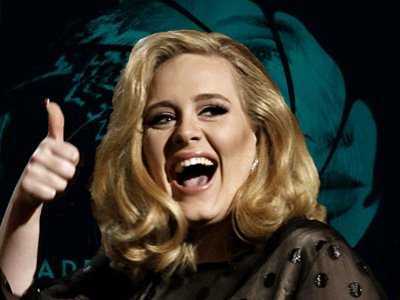 Her first new song since her massive 2011 album "21,""Skyfall" belongs less to Adele than it does to Bond. That is, this is a Bond song at its most traditional, taking its cues from vintage classics in the film's back catalog. Less than 60 seconds in, the song contains a few sonic nods to the instantly recognizable Bond theme. Worth noting is that songs such as "Goldfinger" and "Diamonds are Forever," each sung by Shirley Bassey, already exist in Adele's comfort zone. Adele may not be as slavish to a specific period as some of her neo-soul peers -- her songs never feel like a history lesson -- but they are cognizant of what has come before. Adele's strength, and what has made her such a dynamic figure on the current pop landscape, is her confidently candid phrasing. To listen to Adele is to surrender to the absolute delight of her vocals. Even when the subject matter is at its most solemn, Adele neither succumbs to the drama nor does she attempt to heighten it. She simply sings, her slight rasp giving the songs a lived-in feel, and her sternness conveying resiliency. "Skyfall" doesn't give her much in the way of memorable lyrics, but Adele doesn't need them. "You may have my number," she sings at mid-song, just as the strings are lifting off. But before the orchestra can take over, Adele picks up the pace. She's keenly aware of how to keep the cinematic flourishes at bay, working with them rather than for them. "You can take my name," she hurries, and then pauses before delivering the next line. By the time she declares "you'll never have my heart," she's just toying with the song. It's almost as if she's acknowledging that she's just one small player in a 23-film franchise, as "Skyfall" has all the hallmarks of the Bond standards. There's a slow build, a giant orchestra and a hint of swagger. Credit Adele and producer/collaborator Paul Epworth for opting to have fun in this world rather than trying to own it. They don't over-think it, but they hit the right marks, even bringing in a backing call-and-response choir that taunts rather than preaches. It's perhaps no surprise that the most dreadful Bond songs (the two referenced earlier in this post) have come from the two most recent entries in the series. While this writer is a fan of the Daniel Craig-led Bond films, there's no denying they have taken the franchise down a more serious, somber path, and 2008's "Quantum of Solace" was an action film at its most humorless. 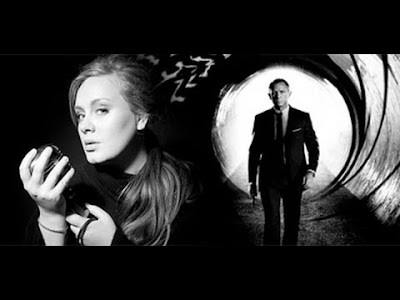 Adele's "Skyfall" foretells good things for this winter's blockbuster-to-be. It's not a reimagining or a musical departure, but simply a righting of the ship. The song is big, bold and seems to have a little spot-o-fun. It likely won't have much of a life outside the Bond universe, but Adele is certainly enjoying her stay.